Following the success of The Munsters TV series it was perhaps inevitable that there would be a Munsters movie. 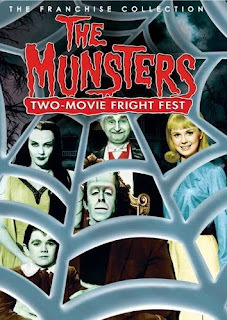 This occurred in 1966 and saw the original primary cast return with the exception of Pat Priest, who was not offered the role of Marilyn Munster, rather it was given to Debbie Watson. For the first time (proper) the Munsters were in colour. It begins with Herman (Fred Gwynne) returning home from the funeral parlour to discover his family sat waiting for him. When he questions why, Lily (Yvonne de Carlo) explains that it is for the reading of a will. It seems that Herman’s cousin Lord Cavanaugh Munster has died. When the will is read they discover that he has bequeathed Herman his estate in Shroudshire, England (an invented county) and the title of Lord Munster. The Munsters head, by boat, to England. On route and onboard there are gags with regard Marilyn’s looks – I will mention recycled gags later – and she also meets a young man named Roger (Robert Pine). Herman has almost instantaneous sea sickness and, in an error with a cure, Grandpa (Al Lewis) turns himself into a wolf with a wolf pill. Though Grandpa turns into a wolf a couple of times in this film it is always by pill rather than through natural ability as it was in series. With the prospect of six months quarantine, the subsequent 'smuggle the wolf off ship' is another recycled gag. Meanwhile over in England we see workmen removing crates from Munster Hall – this ties in with the ‘secret of Munster Hall’ theme that runs, rather like a Scooby-Doo mystery, at the heart of the film. The rather spoilt Freddie Munster (the sublime Terry Thomas) is having a hard time coping with the fact that he is not Lord Munster – amusingly his tantrums actually mirror Herman’s ones and yet we sympathise with Herman and recognise Freddie as a rotter. Freddie wants to knock Herman off, but his mother (Hermione Gingold) has other ideas – much to the delight of Freddie’s despicable sister Grace (Jeanne Arnold). Ma-ma has received word from the mysterious crook known as the Griffin and they will simply scare the Munsters off. This doesn’t stop Freddie sending Herman (on ship) an exploding apple. Also in the household is creepy butler Cruickshank (John Carradine, in a different role to that he played in the series). Of course scaring the Munsters off doesn’t work. Indeed the entire spooky show performed for Lily and Herman – whilst in bed – is met with delight and deemed as a most wonderful way of making them feel at home. As the film progresses we discover the fued between Roger’s family and the Munsters, the secret of Munster Hall and Herman ends up in a car race using the Drag-u-la. We don’t get much lore. I mentioned in my series write up that Herman only knew of a twin brother and then discovers a cousin (a Frankenstein prototype). So where did his English family come from? It seems that after he left Dr Frankenstein, Herman moved to England for a while and was adopted by the Munsters. As for vampiric lore, we get very little. Grandpa does nearly bite a purser's wrist onboard boat and at another point Lily consoles Marilyn with the line “you’ve only had your heart broken. Wait until you’ve had a stake driven through it half a dozen times.” We do discover that Grandpa has been hung several times for being a horse thief – despite the fact that when he gets on a horse we discover it is for the first time! I mentioned recycled gags and some of the lines with regards Marilyn’s looks are lifted directly from the series, the entire trying to smuggle Grandpa in wolf form past the authorities as a stole was done in the series and racing with the Drag-u-la was also done in series. Of course the race is much longer (and potentially deadly) but it was a shame it wasn’t referenced to the series. Indeed they build the car from scratch as though it never existed before. I haven’t mentioned Eddie (Butch Patrick) and though he is in the movie he is particularly sidelined as an incidental character with little in the way of meat to his role. Indeed the film focuses heavily on Herman and Grandpa – which plays to the strength, of course – and Terry Thomas as Freddie, who absolutely shines in his scenes. The colour works but somehow I missed the sense of ‘old Universal’ that the series’ black and white offered. Fun, but the series – to me – is superior and this suffers from recycling and it's feature length shows up the central plot as being very lightweight. 6 out of 10. Eddie, however, gets what is to me the movie's best line and the only one I remember after seeing the movie thirty-plus years ago - "Mother, what's a to-mah-to?" DLR, he does indeed get that line, which leads to a gag that is indeed new in this... generally though he was sidelined, unfortunately.